On July 13th, the REACT project organized the second REACT Regional Round Table titled “Developing a Science ‐ Technology ‐ Innovation framework in Climate Change as booster of the economy”. 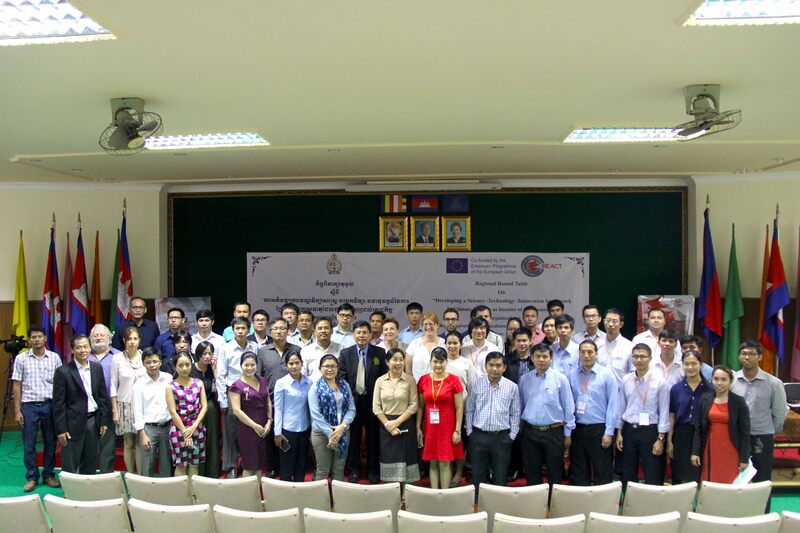 It too place at the Royal University of Agriculture in Phnom Penh, Cambodia, and included over 30 participants from Higher Education Institutions in Laos, Cambodia and Vietnam, as well as local policy makers and students. It is hoped that as a result of this nascent relationship, HEIs and stakeholders will work together to develop jointly high quality R&TD projects and Master / Postgraduate study programmes in Climate Change and related topics having both National and Regional relevance. What skills and competences does the industry need from graduates/employees/potential employees in Climate Change? How can stakeholders contribute to Climate Change education? What are the STI challenges/issues faced by stakeholders in Climate Change that could be solved through research projects? What channels/measures could be provided by HEIs aiming to find/give potential solutions to these issues, and how could they transfer the results to the industry and policy makers?